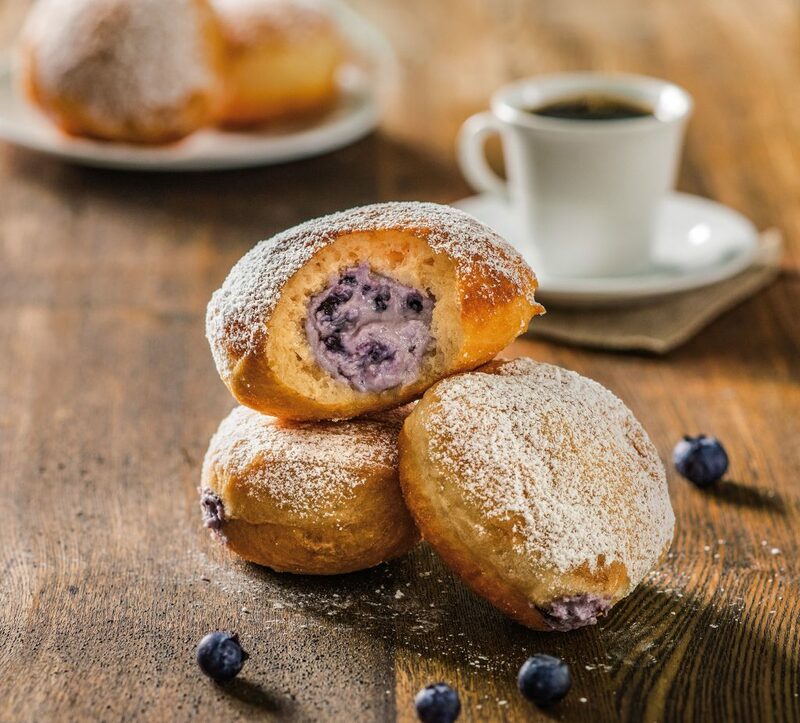 These blueberry filled donuts present the perfect amount of sweetness in any breakfast or dessert. They are great by themselves or with a warm cup of coffee. Cut the dough ball into 14 equal size pieces and roll each into a ball. Set aside on a floured sheet tray for 30 minutes so the dough can rise. In a medium-sized pot, add vegetable oil and heat slowly to approximately 350 degrees F.
Add dough balls to the oil using a slotted spoon, roll the balls around in the oil until they turn golden brown. Cook time approximately 3-4 minutes each side. Remove from oil and place on a paper towel on a plate. In a separate bowl, mix ricotta and 3 tablespoons of the blueberry jelly together until thoroughly blended. Fill a pastry bag or large Ziploc bag with mixture. If using a plastic bag, cut a tip off of one of the corners to pipe the filling through. Using a paring knife or kitchen scissors, cut an X into each donut going half way in. Fill the donuts with the ricotta mixture, sprinkle with powdered sugar and serve. After the donuts are taken out of the pan roll them in sugar to add even more delicious flavor.